The tab 'Settings' is where you will find all of the administrative features and settings that affect your account. This tab nicely divides it into sections: Settings, Billing, Business and Integration. Account section further categorizes the settings. LocalThis is where managers can set the settings for country name,timezone, and date format etc. Communication SettingsHere you can enable/disable the Messaging and Message Wall feature besides controlling who can post wall messages and who can comment on it. Login OptionsEnable or disable your staff to connect their accounts with Facebook, Twitter, Google, Open ID or SSO provider for logging in. Many useful settings that will enhance your scheduling experience e.g. disabling features that you are not in need of, settings when violated will generate schedule conflicts, useful information that should be displayed on the Schedule page etc. Place the mouse cursor on a setting name and detailed info on that setting will display. 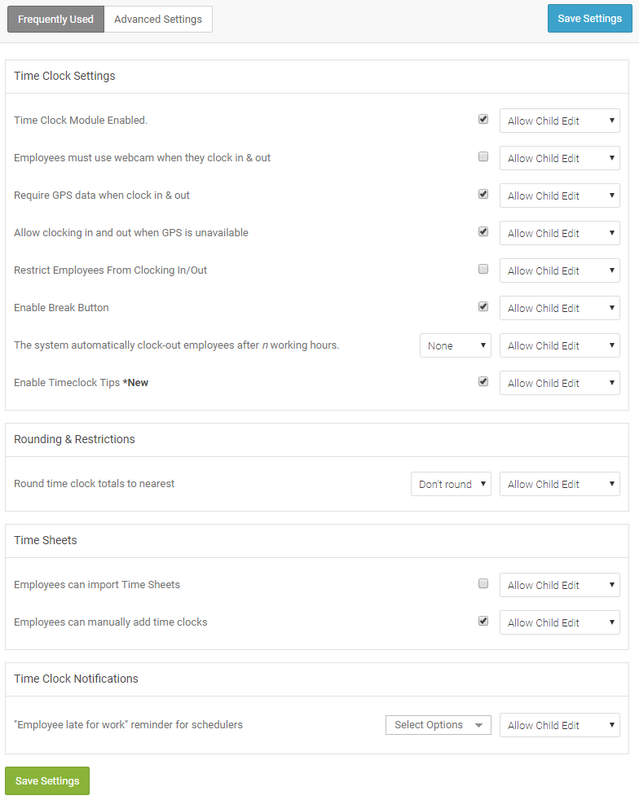 Enable / Disable the time clock module from this section besides rules for clocking in / out e.g. Webcam clocking, GPS locking, Clock rounding, Clock restriction to specific computers/IPs etc. Place the mouse cursor on a setting name and detailed info on that setting will display. Not only you can set up the rules for Leave & Availability Management but also can create Custom Leave Types as well as import 3rd party calendars. Place the mouse cursor on a setting name and detailed info on that setting will display. To access the payroll settings please click the Payroll tab from the left side of the screen and click 'Payroll Settings'. 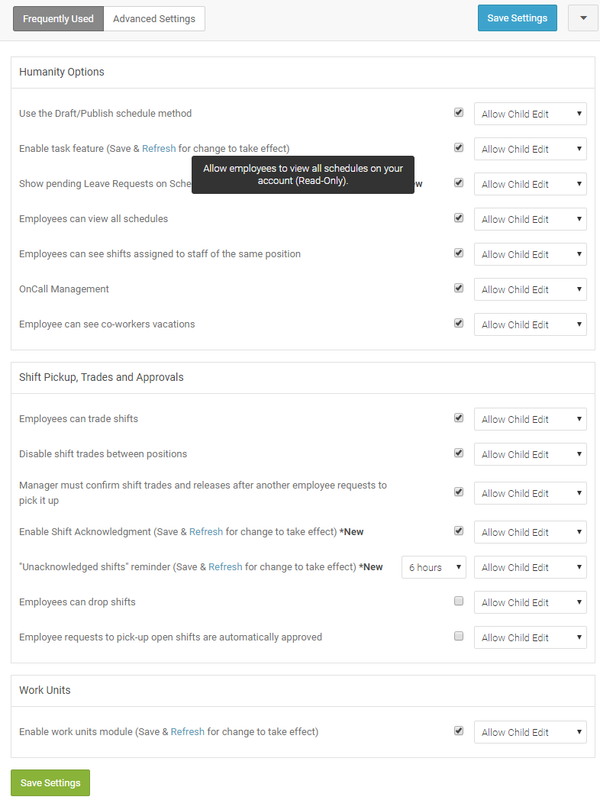 Then from under Payroll settings, managers can set up the rate Cards as well as the daily, weekly Overtime, Choose the default payroll provider, Export format, Currency settings etc. Place the mouse cursor on a setting name and detailed info on that setting will display. Under the Business section, you can see the account event log & Shared Files. Whether you are collaborating on PowerPoint presentations, business spreadsheets, images, logos or general word documents, our file management process is simple and allows you to securely share important files with your staff. Go to the tab 'Settings' -> 'Business' -> 'Shared Files'. You will see all the files shared already or can upload a new file and can share with your staff. Integration section sections for 3rd party Apps, application's Data API and Single Sign-On. Humanity's 'Data API' is a programming system that allows your new or existing in-house/ 3rd party software to integrate fully and have read and write access to your Humanity information. In addition, you can manipulate data in your account by using the various API methods.